Idli, a round shaped steamed rice-lentil cake,is one of the healthiest breakfast item of Indian Cuisine and staple food of south indians. The cakes are made by steaming a batter consisting of fermented black lentils(urad dal) and rice.You can also buy idli batter in the Indian grocery stores too. Today in this recipe i have used Rava Idli Instant Dry Mix(MTR Brand) which is available in indian store and amazon as well.You can use any brand. Grease your idly plates with oil or ghee,Pour idly batter into the idly plates/moulds.Do not over do. Add 1.5 cups of water to the Instant pot. 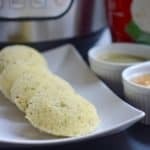 Place the idli stand in to the Instant pot. Close lid and keep in VENTING position and turn on 'STEAM' mode. Steam the idli trays in the IP for 10-12 mins.Note:Timer on the instant pot does not work in the venting position, so you have to monitor time with a separate timer. Check the idlis by piercing a toothpick in it. If the tooth pick comes out clean, the idlis are done. Remove idli's from the moulds. Serve hot, with coconut chutney and sambhar. 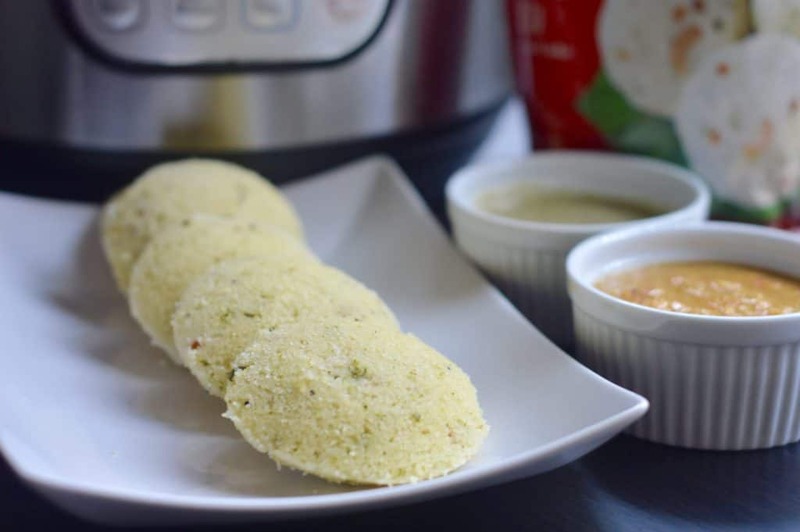 2.If your idlis are still uncooked then do not worry, steam for another 2 minutes.